Thunderstorms toppled power lines in the Linda Vista area of Missoula, MT. Western Montana may get another dose of nasty weather this evening. National Weather Service meteorologist Dave Noble says conditions very similar to those that created powerful and destructive storms yesterday could soon start moving into western Montana. "The threat may exist more over the Bitterroot Valley, north and east towards the I-90/Drummond/Ovando areas. 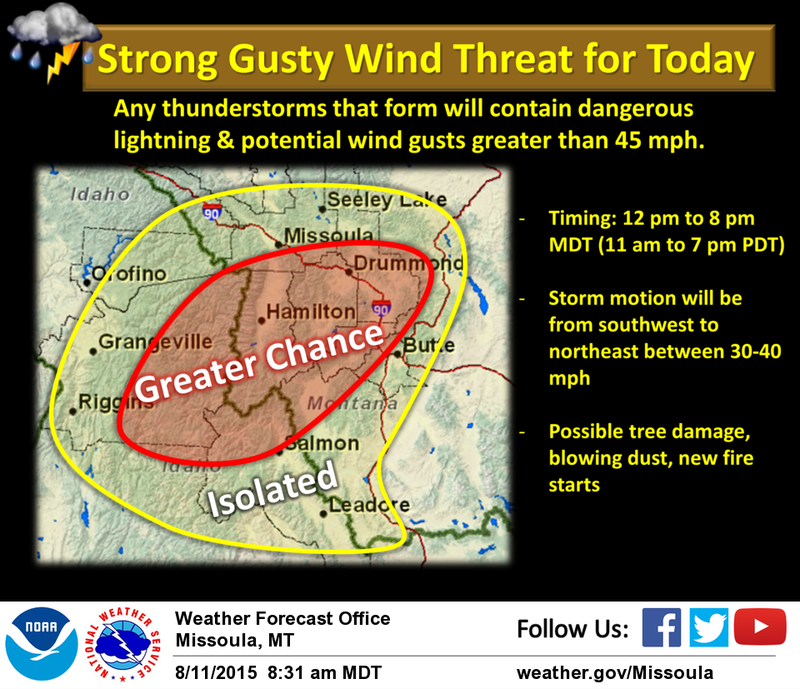 You get the mixture of hot, dry conditions and thunderstorms there is the potential for strong wind gusts. If the right conditions occur, we could see gusts as high as 60 miles an hour." Many areas had similar powerful winds yesterday. Mineral County, for example, had some trees blow down across Interstate 90. "And there were also some trees down near the pass with some power outages. We had a wind gust of 70 miles per hour in Arlee and we heard of some tree damage and some power lines down in the Saint Ignatius area as well," Noble says. Today started with about 9,000 Northwestern Energy customers in Missoula and the Bitterroot Valley without power. Company Spokesman Butch Larcombe says today’s goal was to restore power to at least half of those affected customers. 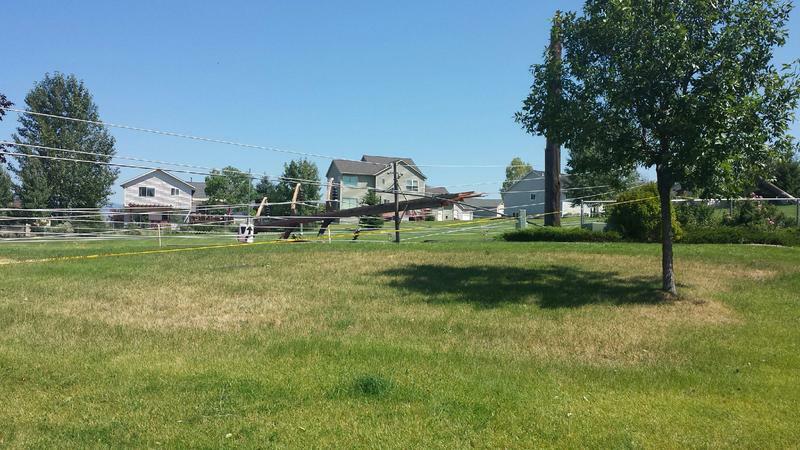 Downed power lines in Missoula’s Linda Vista/Miller Creek neighborhoods are presenting a significant challenge. 2,500 customers there still have no power. "It’s going to be many hours yet before were going to be able to restore them," Larcombe says. "We’re having to do a lot of preparation work and gathering of materials to be able to make the repairs out there that we need to do. It’s a complicated process. Those people are going to need to bear with us and maybe make some plans for either possibly leaving their homes or making accommodations for freezers and refrigerators and things like that." Larcombe says false rumors making the rounds about a two-week power outage in the Linda Vista and Miller Creek neighborhoods. He says that’s not true, but another day without power is a possibility. Most of the rest of Missoula should have power restored by this evening. The Weather Service recorded wind gusts of 74 mph at Missoula International Airport during last night’s storm. That wind damaged hundreds of local trees. Missoula Urban Forester, Chris Boza, says crews from different departments are teaming up to help Missoulians clean the mess from their neighborhoods. "And they’re doing a grid pattern. We’re taking our material to drop-off sites. One is at Playfair Park. One is at Fort Missoula and the other is at McCormick Park." O'Brien: And then it gets mulched up? "Correct. We’re looking at getting a tub grinder in once that’s done and then running the material through the tub grinder." Missoula’s Western Montana Fair opens today. Fairgrounds manager Todd Garrett is expecting a big turnout, but he acknowledges that last night’s storm took only moments to ruin a lot of hard work. "Trash cans blew over. Portable toilets blew over, handwashing stations too. But probably one of the bigger tasks is getting all the tents back up and the shade cloth too. For example, back in the beer garden area all that blew down and got tangled up," Garrett explains. Garrett says the Western Montana Fair will go oneven if more severe weather moves in as forecasters say may happen this evening. "Our security office is in constant contact with the National Weather Service and if the weather gets severe enough, we will evacuate the grandstands, close down the carnival rides, encourage people to go into buildings, avoid tents and trees to keep them safe. If it’s like last night – if it’s after 20 minutes or so – if we can, we’ll resume the activities." Little valley rainfall is expected to accompany this evening’s forecast storms. The rest of this week’s weather forecast in western Montana is looking rather grim according to National Weather Service meteorologist Dave Noble. "A continued chance for more showers and scattered thunderstorms. Also, the heat will continue through the remainder of the week. We could see another bigger round of thunderstorms by this Friday. We’ll have to keep looking at that to see if that’s going to be a big risk or not." Noble’s advice for Montanans during this stretch of volatile weather? Pay close attention to National Weather Service forecasts, have an escape route in mind if it looks like bad weather is creeping in, and avoid trees and tents during lighting storms. 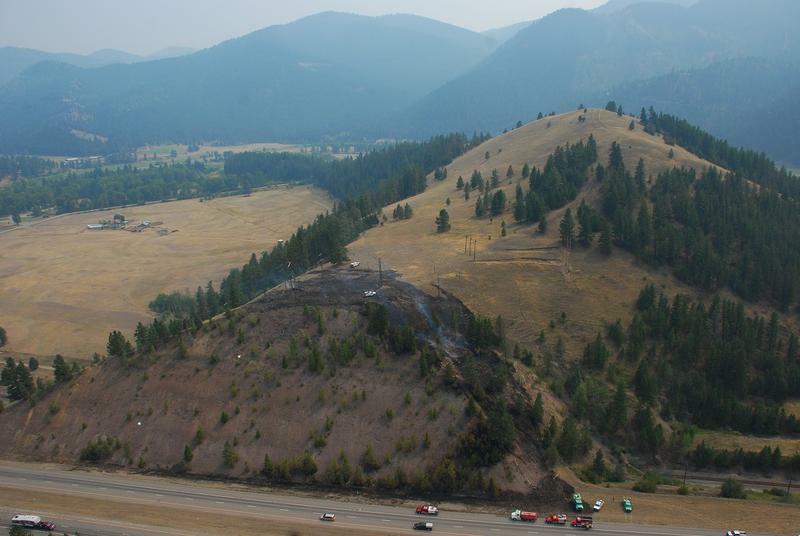 The Reynolds Creek Fire burning six miles east of Logan Pass is 67 percent contained and burning just under 4,000 acres. The fire grew slightly on Saturday due to high winds but its growth was smothered Sunday with heavy smoke. August 11, 2015 - 11:00 a.m. Here is an update from the National Weather Service. Northwestern Energy predicts electricity bills for its residential customers will decrease by $3.10 per month starting in July. Northwestern spokesman Butch Larcombe says a couple of different factors are at play.